My husband has been stewing over the flagpole issue with Bob the Builder. In the mornings, we like to sit with our coffee and look out the front window at the birds, turkeys if they come by and the squirrels. As the trees lose their leaves, the flagpole is becoming more visible. Look, I don't like it either - it does feel as if Bob is walking all over us but right now I am sick, and I don't need this. I told my husband, to let it go for now. I did call our County Assessor's office. They recommended to come down and look through plat maps. I just don't want to get myself all worked up over it. I wish my husband would have been this passionate with all the sawing, and pounding that BB does early in the morning this past summer. Neighbors can be so aggravating. Today, I walk along my driveway and get the strong odor of barn droppings and sawdust. My neighbor cleans their barn and puts the material as close to the property line and my house as they can. I called the county and they told him he could not put it on the property line. So I guess they are hiding it in the small wooded area close to the property line. Or their barn is filthy as heck. I'll never know for sure. Your hubby has got to rationalize it. Bob seems to be passive-aggressive. 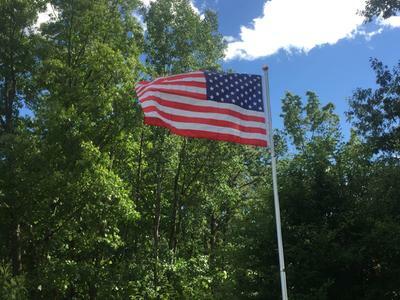 I love seeing the flag waving in the wind. But I understand your frustration. Here in Kansas it is okay to cut the neighbor's tree if it hangs on your property! He didn't just cut the tree that hangs over, he cut whole branches off that were on our property. We have a flag pole so I am not against a flagpole but he knew when he placed the flagpole there, that there were trees- When the wind blows it scrapes our tree branches. He's an old man that just didn't think. He probably is a person who always gets his way.